The Penguin Club is a group of enthusiastic volunteers who enjoy making the technical side of shows come together. We're based in Cambridge and we work in venues large and small around the city. We regularly meet socially to catch up on current productions and life in general. We're always on the lookout for new members and if you want to join us see Get Involved. 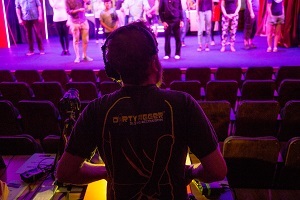 If you're producing a show and need our help see the Producing Companies section of our website. You can also find us on Facebook (Penguin Club) or Twitter @TheatrePenguins. The Penguin Club has been helping to stage amateur dramatic and musical productions in and around Cambridge since 1983; we do not perform and we do not provide set, costume or prop hire.